Visit Niagara Falls and Niagara-on-the-Lake with a 9-hour day-trip from Toronto. 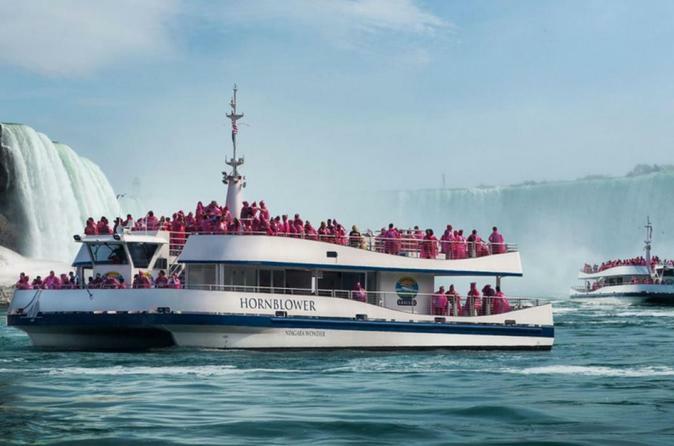 At the falls, enjoy a ride aboard the Hornblower Niagara Cruise, where you'll be treated to amazing views of all three falls. Led by a local guide, see awe-inspiring views, take part in optional activities, learn history, and see the beautiful natural splendor the make Niagara a place with a little something for everyone. Tour includes a general line bypass and pickup and drop-off from hotels in Toronto. Embark on this one of a kind tour experience with our professional and licensed tour guide. Enjoy legendary stories, history and fascinating facts about the Niagara region. Hornblower Niagara cruise. Awaken your senses with a face to face encounter with the falls and uncover the mystery of how the combined power of the cataract falls results in a mind-boggling flow-rate that provides hydroelectric power to the entire region. From here we will venture further down the parkway to the Table Rock complex to the closest viewpoint of the falls before it makes the 188 foot (57 meter) plunge. Free time will be allotted for self-exploration and lunch dinning. Once we have experienced the falls sit back, relax and cruise the Niagara Parkway as we head towards Niagara-on-the-Lake. Observe historic landmarks including the Whirlpool rapids, the Mackenzie Printery, Queenston Heights and Fort George; The National Historic Site from the war of 1812. Enjoy a stop in town to explore the first Capital of Upper Canada, with local shops and unique views of Lake Ontario. For the grand finale of your Niagara adventure, try some rare and unique ice wines at one of Ontario’s top rated wineries.